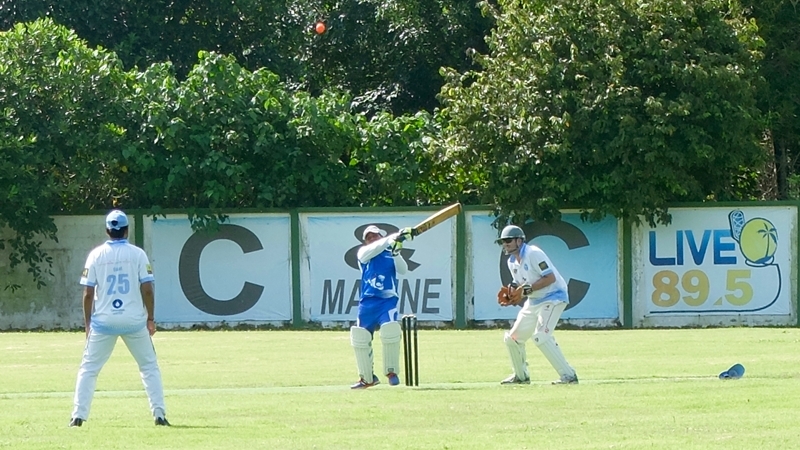 CRICKET: With yet another week off from the C&C Marine sponsored 8 by 20 League, the ACG hosted a third friendly in as many weeks between the Island Cricket Club (ICC) and Patong last Sunday (July 23) in a limited 25 over format. Leading into the game, ICC held a 2-0 lead in the series after two commanding victories over their Patong rivals. Opting to bat first, ICC’s captain, Divan Mydeen sent Ravi Naik and Vijay in to face Patong’s opening bowlers, Shivam Bhattacharya and Sami Pir hoping to lay a solid foundation to their innings. A tight start from the opening bowlers, including a maiden first up from Pir led to Vijay being trapped LBW by Bhattacharya for just one run, raising Patong’s hopes of an improbable victory. Unfortunately for Patong, the end of the opening partnership beckoned the arrival of a highly destructive and in-form Prakash Jha. Supported by Naik (15) and then Mayur (26), Jha put on a show for the second time in the friendly tri-series, punishing the Patong bowlers with 10 sixes and seven fours. A tiring Jha was finally stumped by Andrew McMillan off a temptingly floated delivery from Patong stalwart Anthony Van Blerk for an outstanding 119 off just 56 deliveries. Following the dismissal of Jha, the ICC innings collapsed being bowled out for the first time in the series. But the damage had been done by Jha, however, as they posted a healthy total of 191 from 21.1 overs. It was a mixed effort from Patong’s bowling department, with solid contributions from their openers, while Flowers, Raju and Van Blerk accounted for the final six wickets in taking two-a-piece, which came in a flurry to conclude the ICC innings. Patong began their run-chase with regular opener Michael Flowers along with Anthony Van Blerk, with both tied down early on by particularly tight bowling from the Arun and Prem. The first change to the bowling saw the classy spinner, Vijay return to the crease, this the same player who ripped through Patong’s tail end last weekend. With the required run rate increasing, Van Blerk felt the need to break the shackles as he hit a powerful boundary down the ground before being bowled by a clever Vijay yorker on the very next ball. Van Blerk’s dismissal for 15(24) brought Patong’s opening bowler Shivaam Bhattacharya, to the crease in the hope he could hit quick runs at the first-drop position. At the 10-over drinks’ break, Patong had been held down to a score of just 39 for one by some very good ICC bowling. Following the break and requiring 153 runs from the last 15 overs, Flowers hit a towering six onto the roof of the gardeners shed off the bowling of Ravi Mehra. Unfortunately, yet again set to go on and help boost the Patong score, Flowers fell to a deceptive shorter ball from Vijay, and dismissed by an over the shoulder catch on the offside for 25 (40). Joined at the crease by Andrew McMillan, Bhattacharya kept the scoreboard moving by hitting a couple of boundaries, keeping Patong’s slim chance of victory intact. Ravi Naik eventually had Bhattacharya caught, a useful contribution of 23 runs from 16 balls from the pinch hitter never the less. Patong captain, Raju came in with attack on his mind, and when McMillan fell for 6(12) off the bowling of Prakash it seemed clear that the skipper was Patong’s last hope of claiming a result, hitting two sixes and two fours before being bowled by Savesh for his team’s highest score of 28(15). The tail-enders gave up on the futile chase and Patong were eventually bowled out for 133 with Sajal Gaur left holding his bat 9*(17). A comprehensive 58 run victory for ICC with Prakash again the obvious choice for Man of the Match with bowling figures of three wickets off 13 deliveries to go along with his demoralising ton earlier in the day. The Patong side were left holding their heads after a third straight defeat and will look to revive winning ways after licking their wounds during a team rebuilding session on Koh Yao Yai this holiday weekend before the C&C Marine League resumes. If you would like to get involved with cricket as a player or a coach, please contact the Phuket Cricket Group through Facebook or by email at jason@acgphuket.com Or check out the ACG Cricket and Sports Facility Facebook page for all upcoming events.